The first Server processor from Intel that is neither a tick nor a tock, the E3-1200 v6 is a socket compatible optimization release to replace the E3-1200 v5 Skylake. Its most notable change is support for Intel's Optane memory technology, which is major new technology release from Intel. Are you in the education/research industry? We are very excited to announce major discounts to latest-generation Tesla cards for education institutions or government-sanctioned agencies that purchase on behalf of schools. We're offering substantial discounts on Tesla P100 and P40 cards. This discount is per card! Let's say you build a system that supports 8 GPUs - That's a whopping $12,000 savings in one machine alone. There are no limits on the amount of systems you can build, either. Thinkmate Servers now updated with support for NVIDIA's New Titan X (Pascal) ! For a card that NVIDIA says packs an "irresponsible amount of performance", it would only make sense for us to make sure our customers can take advantage of such power. 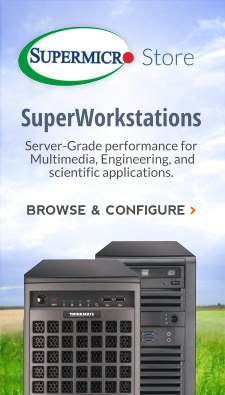 Indeed, demand for these servers have been sky-high ever since Thinkmate became the first vendor to make them usable in servers through a partnership with Supermicro and NVIDIA. Now you can take advantage of the latest Pascal architecture, which NVIDIA says offers up to 3x faster performance than the previous generation. Demand is high, so if you plan on using these cards, act fast. Intel has quietly released the Xeon E5-1600 v4 - The single CPU version of Intel's Broadwell-EP, the E5-2600 v4, which we have covered here at Inside Thinkmate during launch a few months ago in March. While most of the specs are similar, there are a few differences, which we have covered here, as well as a comparison against the older version of this single processor release - The E5-1600 v3. We are now offering, for the first time, 10TB drives that can be used to be configured in our servers and workstations. 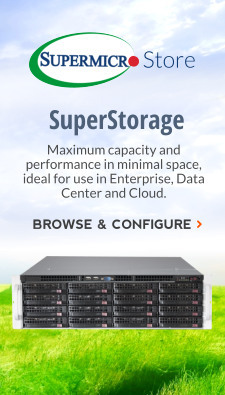 10TB drives aren't new, but drives that can be used reliably in an enterprise setting are. What makes these drives special and why should you use them? Thinkmate is the first in the industry to support GTX-series GPUs in rack-mountable servers as an economical solution for single-precision oriented tasks like gaming, accelerated machine learning and more. Following the success we've had with Tesla-series cards, we now have solutions available with support for the newest cards from NVIDIA: GTX 1080 and GTX 980. A follow on to Haswell-EP, Broadwell-EP features a new 14nm process technology that has enabled Intel to increase the core count while still utilizing the same power envelope as its predecessor. Broadwell-EP processors will be the last to arrive as Intel phases out their platform and move to the new Purley Platform for Skylake and Cannonlake processors. We know our customers get just excited as we do when there is a new CPU refresh. Unlike our competitors, we want to make sure you can get your hands on these new systems the moment they become available, and we've been working hard to make sure our online configurators were ready to support these new chips. 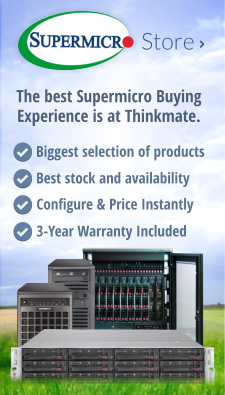 Many Thinkmate-branded and Supermicro-branded Servers and Workstations are available online and ready to be ordered today. There is a fair amount of talk about NVMe lately as the leading non-volatile memory manufacturers focus their shift on creating products based on it and as more people – as he wave personally witnessed here at Thinkmate – Start adopting them. Here we’ll try to explain briefly what NVMe is, how our customers are using it in the real world and how you can purchase the right drives and put them in the right server. Intel Xeon E3-1200 v5 (Skylake) is here. The next ‘tock’ from Intel flexes its graphics muscles and launches. What's new? Today marks the launch of the Intel Xeon E3-1200 v5 Skylake processors, made to power servers and workstations in the data center and the office. We had access to these chips earlier than the general public, so we made this feature to share what we've learned. We'll let other tech publications like Anandtech, Ars and others cover the very technical stuff in the next few days, what we've tried to do here is to give you a general overview of what's new, and some usage scenarios. Let’s start off by focusing on the things that matter on the server side of things. Compare The Major Hard Drive Technologies - SATA vs. SCSI vs. SAS. Network-attached storage (NAS) is the name given to dedicated data storage technology that can be connected directly to a network to provide centralized data access and storage to network clients. Data is the most valuable asset of any business today. Lost data means lost business. Learn about common storage terms and how to protect your data. The iSCSI protocol is a method for transporting low latency SCSI blocks across IP networks. The iSCSI standard maps SCSI blocks into Ethernet packets.